We absolutely love the new tiles and hand railings that New Horizons Flooring installed. The work was done on the exact dates that were given to us prior to installation. The whole crew was professional and easy to work with. The craftsmanship of the hand railings is superior. Also, the work of the tear out of old carpet and tile and install of new tile was extremely quality work. We would highly recommend New Horizons Flooring and give this company the best rating possible. I recently had a major tile project completed by New Horizons Flooring Company where I was having two bathrooms remodeled simultaneously. After researching other companies and receiving other estimates, it was a relief to have the owner John come out and give an estimate. Not only was he very knowledgeable but he was easy to work with and the estimate was VERY reasonable… He promptly returned phone calls and stayed in contact prior to the work starting so I was never left hanging. The workers were kind and clean throughout the entire process. Due to the size of the project, it took a week to complete and turned out better than I expected. I HIGHLY recommend New Horizons Flooring Company to anyone and I would not hesitate to use them again! Title: Would Hire Them Again! John, the owner was very attentive and sent some excellent help (Alex and his coworker). We asked for some grey in our hardwood stain and they gave us a few choices after seeing a few pictures that I had given them and it turned out perfect! We would hire them again! Thanks Horizons! Love it!! I’d use them again and would refer them to others. New Horizons Flooring provided excellent quality service throughout our entire remodel project. John offered us suggestions, innovative ideas, and knowledgeable opinions on our initial consultation. New Horizons added, extended and refinished our hardwood flooring. Extensive tile work was completed. 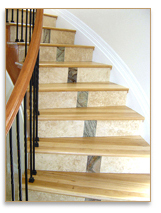 An interior staircase was redesigned, redone and finished. Our entire project was well organized, structured, well maintained, and on schedule. Most noticeable was the quality of the work accomplished by everyone involved on this project. New Horizons Flooring added hardwood flooring to our existing hardwood flooring and we had them change the color. Andrew the installer did an excellent job finishing within the time frame and communicating what processes were happening on what days and worked well with our schedules, very easy to work with. You cannot even tell where the old and new joined. To quote my wife “I love it, it is gorgeous”. Great job by all from beginning to end. Title: Superb Workmanship and Service! We currently live in Grand County (Tabernash) and to find any type of service provider in any type of trade, is extremely difficult. We contacted many companies on the referral list and New Horizons Flooring was one of the only companies on the list that would return the call and agree to provide an estimate. James, the project manager, met with us to look at the existing bamboo floor and to also provide an estimate on installing a new floor. The estimate was very thorough and itemized. When talking to James about the estimate, we talked a lot about if we chose to keep the bamboo floors, how long he thought we get out of them (they were already 15 years old). Very honest he said 3-4 years. At that point we made the decision to go with new oak flooring. During the demo James showed us areas of the bamboo that would not have made it through the refinishing. It was refreshing to us that he went the distance to show us what had happened to the floor and why it failed. The new floor that has been installed is great. It had to be glued down because of the floor being concrete with in floor radiant heat. They took great care of the where they were going to nail because of the radiant heat. They showed great respect for the existing cabinets and molding and went the distance to make sure everything was put back together correctly. They are very good at what they do, they communicate exactly what is going to be done and there is nothing hidden in the estimate. We couldn’t be more pleased with the outcome. From start to finish, these gentlemen are the best. I’ve used several hardwood floor refinishing companies in Denver over the past 3 decades, and New Horizons tops them all – from the quoting process through scheduling to after work touch-ups, they are true professionals. I am pleased to recommend them highly. After researching various Hardwood Floor Companies we chose New Horizons because of their excellent reputation. Initially when I contacted New Horizons John responded immediately to my request for a bid (other were slow in responding) which set the tone for the work ethic to follow by the New Horizon Staff. WE ARE VERY PLEASEDWITH OUR NEW HARDWOOD FLOORS…. Watching John’s crew from beginning to end was truly gratifying their expertise and quality work in all phases required for new floor installment provided us with beautiful finished hardwood floors. Complements from family, friends and neighbors have been overwhelming. We would recommend New Horizons Flooring to anyone looking for a great value, a professional staff and most importantly fantastic looking hardwood floors. It went fabulous! From the minute we contacted them to the completed service, New Horizons Flooring was great. John came out and measured and the next day we had our estimate. I think to be a very fair price. They always kept us well informed of next steps in the process. Always on time. John, James, Alex, Amy – all very personable in our communications and professional. All very respectful and patient as we made our selection of the right stain. For us, this was a big purchase, somewhat of a luxury item – and we felt in very good hands the entire time. The floors, they are absolutely beautiful! The product and the customer care made this an awesome experience. I would absolutely recommend them. And look forward to contacting New Horizons Flooring for our other up-coming flooring and tile projects. We are absolutely thrilled with our ‘new’ floor. Mike with New Horizons did a fantastic job. We elected to go with a lighter stain than the original stain used when the house was built. The lighter color really brightens up our entry way and kitchen. We will use New Horizons when we next need hardwood floor care. What can I say about John, James and the rest of the amazing team at New Horizons flooring other than I will and do tell everyone about them. We have used them twice in 2 different houses and will be asking them to come back in the fall. The first house was built in 1995 and we were blown away by their ability to tooth in flooring and make it seemless with what was already there. Then the refinishing and staining came, simply breathtaking. I believe it was their flooring that helped us to sell our home in 20 days when we fell in love with 100 year old cabin. I wasn’t sure what to expect with our home owner installed, 60 year old destroyed floors. Yet again, the patchwork, sanding, staining and sealing brought these floors back to life and they are simply beautiful! We love that they are a family business, extremely professional, passionate about their craft and it all shows in the finished product. Thank you! We had a new concrete shower pan, shower seat, tile floor, and partial tile wall installed in an old bathroom. After several bids New Horizons’ quote was the lowest by far. The work was completed on time despite some changes in tile plans and unexpected challenges with the concrete shower pan. The new bathroom shower and tile looks great and gives us the look we were wanting. The staff was courteous, kept the worksite clean, and met all our requests. We recommend New Horizons for your bathroom renovation work. We had water damage to our house and consequently our hard wood floor was damaged. After talking to John we made arrangements to have our floor sanded and refinished. We hit a snag and work needed to be started about a week early. John juggled his work load and was able to accomodate our schedule. The work was done as promised and completed on time. All of the work crew was polite and competent in their part of the job. We would highly recommend this company for hardwood work. Working with John at New Horizons Flooring Co. was a stress free process. He was very honest about the schedule and cost during the bidding process and provided recommendations on design. Once we chose him to do our install, his crew was prompt and finished the job on time. John communicated well during the install and followed up after the job was complete to ensure that we were satisfied with the results. The quality met our expectations and we would recommend New Horizons to anyone interested in having new tile installed. I was in need of hardwood work and went to Tom Martino’s list. There I found New Horizon’s Flooring. I called and spoke with John (the owner) who took the time to explain options and cost to me. His talented crew was very helpful, never too busy to answer questions. Though there was one minor glitch in the process, it was quickly and thoroughly corrected. I am pleased with their work quality and professionalism. The owner actually came to job site on several occasions to check on things. I do recommend New Horizon’s Flooring. Thank you! Just wanted to let you know how much we love the new look of our refinished hardwood flooring. We were very impressed with the fact that once we called you for an estimated date, you were able to work with our busy schedules in a timely manner. Your experienced workers were both courteous and considerate of our home and belongings. They did a fantastic job of completing the project to our satisfaction in only 1-1/2 days while carefully blocking off the area and keeping dust to a minimum. I would be happy to recommend your services to our friends or anyone looking for top notch professionals. Thanks, again. New Horizons Flooring Company sets a new horizon for our bathrooms. NH did a great job remodeling our home’s master bath and powder room bath. These were extensive updates with new & repositioned shower, tub & deck, sinks, vanity top, toilets, heated flooring, slab stone tops & shower parts, and wainscot all around. 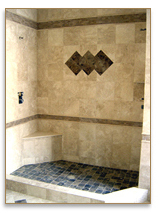 We were pleased with the flooring job NH did for us couple years ago, so we called on them for our bathrooms project. John was prompt, listened to our ideas, added some good suggestions – and helped us decide on our final plan. He was also flexible, as we reduced costs by doing the plumbing procurement online at greatly reduced prices, shopped around for the very best values on our tile & stone – and also doing some of the work ourselves. These added up to VERY significant $$s savings on our project – Yahoo!! For this broader scope job, NH brought in their ‘friends’ – the plumber guys, the electrician guy, the dry wall guy, the painter guy – all impressive pro-tradesmen. And as with our flooring project, the NH guys did a masterful job from demo – to setting our vein-cut planked travertine shower – to the ‘tricked-out’ 5 element, angle set powder room’s wainscot. These guys really do seem to enjoy a challenge!! Bathroom projects can be difficult, requiring a range of expensive components and trade skills in a complex multi-phased work plan that extends over weeks and even months. NH helped us limit our risks and complexity by taking-on everything except the slab stone and shower enclosure glass work. With whom they easily coordinated with and our project when smoothly.We’re now very happy with our updated bathrooms, and give a BIG THANK YOU to New Horizons (they’re more than just) Flooring Company!! Title: Very clean and respectful! I just wanted to let anybody that is thinking of having their bathroom shower retiled they could have no better company then New Horizons do the job. They came to my home on the 6th of March and finished on the 8th of March. They were clean and made sure that my carpet and wood floor was protected. They were very courteous, and respectful. And in the future if I need any more work done I will be calling them back. They worked within my budget and were fair in their pricing. New Horizons Flooring Co. did a top-notch job on two homes of mine, the home I live in and a rental property. They were always prompt, efficient, and did the hardwood flooring work beautifully. John Kramer (owner) and Daniel were a pleasure to work with, and they were terrific in accommodating all of our specific scheduling logistics given that both homes were done at nearly the same time when we and our renters were all on vacation. I was slightly nervous having hardwood floors installed while being out of town, but the New Horizons folks were beyond trustworthy and professional. And in the end, my family and I loved coming home after a week to brand new floors. I would use New Horizons again in a heartbeat and would highly recommend them to any of my friends. I’ve hired New Horizons twice. We were so pleased with the results, we recently hired them again to tile the floor and tub surround in a bathroom and replace the tile around our fireplace. John’s crew was courteous, professional, and did an excellent job on the bathroom and the fireplace. We’ve had lots of compliments on the tile work from our friends and family, and would definitely hire New Horizons again. We recommend them to anyone looking for a professional job at a reasonable price, with work that’s done on time and at the price that was agreed upon. It’s very refreshing to work with a contractor who genuinely cares about their client and wants to make sure the work is done to the client’s satisfaction. We got John Kramer’s contact information from the Tom Martino list, and he became one of three flooring companies we interviewed to install new hardwood floors in our living room and home office. Great Job & a Great Company. We decided to have our wood floors refinished and tile installed in our kitchen and baths. I referred to the Tom Martino Website and called New Horizons after reading all the testimonials. They did a terrific job. I appreciated their consideration of our family, and small children’s needs, when scheduling the work. The staff was very professional and friendly and the communication was fabulous. We love our new floors and will definitely call John and New Horizons for any future projects. This was a stair project that couldn’t be finished by other “experts” and required some ingenuity. The products are not normally available in the U.S. so the process and techniques were unique. The New Horizon staff had no problem figuring it out and as a result I have a beautiful finished stairway. The team is certainly part engineer (to figure out how to do the project), part craftsmen (to actually do it, and part artist (to make it look marvelous). The attention to the smallest detail, the extra time they took, and their solutions for the unusual problems make these craftsmen the absolute best. I wish I had initially found these guys. I have other unique projects on my horizon and I know who I will call. From beginning to end the New Horizons team was excellent. Easy to work with, on-time, trustworthy, and the finished product turned out great! I will use them in the future, recommend to anyone looking for this type of work. John, Dan and their team came in and did multiple things in our home. They put in a custom staircase, which you can see on their website, they redid our entire master bathroom in custom tile, and they put in a detailed, intricate, beautiful Travertine floor in our entryway. They helped us to find and pick exotic Hardwoods for various rooms in our home because we wanted something different. We appreciated John and his crew throughout the entire process. We’ve already told several of our friends about them and the beautiful work they have done. We definitely recommend them and they are the only ones we will call for future work. Pros: Fair and competitively priced. Extremely helpful and patient. Worked with us and helped us to find new concepts and new ideas. Started on time, finished on time. Most impressive was everyone on the team was really nice. We have used New Horizons for multiple work in our home. They have laid new hardwood throughout our house on 2 separate occasions; retiled our bathrooms; retiled a fireplace and repaired engineered hardwood due to a flood. I would not use any other company. They give an upfront timeline for the work and stick to it. I have never dealt with a company as reliable as New Horizons. Pros: Very reliable and upfront. Professional and honest. Family run company. We had New Horizons redo all our hardwood floors. We chose to do it while we were on vacation to avoid the hassle of dealing with the mess. When i first met John, he arrived on time, was professional and the most knowledgeable of all three bids I had completed and gave me and honest opinion of what my floors needed. He submitted his bid to me within the time frame he promised and worked with us regarding payment. Although they were not the cheapest bid, i felt the most comfortable going with New Horizons, especially given we were going to be gone because of his professionalism when we first met and follow up conversations. While we were out of the country, we had a dog at the house with a friend watching. John and his crew also played with our dog to help her feel better about being alone. Upon return, our floors looked beautiful, they were done when promised and our house looked exactly like when we left it. Again, John and his crew were professional and cont. to call periodically to make sure everything is good. Very, very happy with the service!! Pros: On time, dependable, excellent work product, honest, reasonable and extremely professional! Just like to take the opportunity to thank New Horizons for the installation of our beautiful hardwood floors. We had five rooms done. New Horizons took time to explain the project and answer my many questions as the installation progressed. In fact they did such a good job we just recently had them return to install marble around our fireplace. Same result. Excellent work- Thanks New Horizon’s!! Pros: Answered all of our questions. Was on time and on budget. The crew always met their commitments. They were here when the said they would be here. New Horizons remodeled my kitchen awhile back. They put in a beautiful tile back splash and a floor to match. They did a good job of helping me to figure out what I wanted and how the finished look would turn out. They did a fantastic job and we were very pleased. Their workers were all very professional and polite. I have already recommended them to several others. Thanks New Horizons!! I contacted New Horizons to get a bid for some tile work and remodeling of 2 bathrooms in my home. I also wanted to refinish my fireplace with granite and a new cherry wood mantel that was to match new handrails and balusters I had put in my home earlier in the year. When my original company who was to do my fireplace declined the job, John at New Horizon said “no problem” we can do that and kept my home projects on schedule to be completed before the holidays. My bathrooms turned out beautiful, but my fireplace turned out absolutely GORGEOUS!!! It turned out as I was told “the focal point of my home”! What I appreciated was the accuracy and fairness of the bid, John kept in constant, daily contact with me to keep me abreast of what was going on, the 2 bathrooms and fireplace project happened right on schedule. He called a few weeks after the project was completed to see if the work they had done was to my satisfaction. There were no surprises. I would not hesitate to call John at New Horizons to do any additional projects in my home. After owning two older homes and having many projects done in them, New Horizon was in the top three of contractors I have had working in my home. Pros: Reasonable bid Paid when satisfied with work and work completed excellent communication. Completed job as promised.